Villa Basu is located in a private villa compound just off Nai Harn beach providing you unparalleled views of Andaman sea with Phuket’s magnificent sandy shores! This two-bedroom paradise is located in a quiet neighbourhood in order to ensure your privacy and to offer an exclusive ambience amidst beautiful natural surroundings. At Villa Basu, you will find ample space to rest and enjoy blissful moments with your family and friends, under clear blue skies! The master bedroom is well-furnished with a king-sized bed which sits directly facing the swimming pool which can be accessed through glass sliding doors. The second bedroom is the guest bedroom and is also furnished with a king-sized bed. The rooms share a large, modern bathroom which is fitted with a large Jacuzzi tub and a spacious shower area. The rooms are air-conditioned and contain some elements of traditional Thai culture in their décor to merge the modern with the traditional! 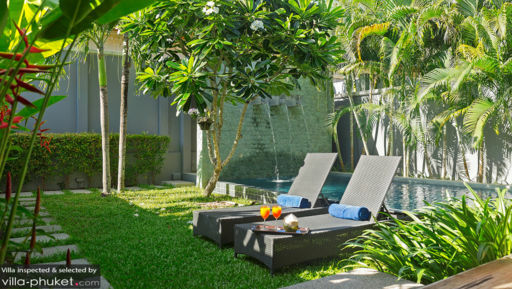 The swimming pool glistens amidst tropical foliage with rich natural greenery all around it. In the tropical garden, there is a lot of room for you to do some yoga or simply walk on the grass. The swimming pool sits in wait, ready for you to jump in and splash around with your family and friends. The outdoors provide you with an expansive space to have some unrestricted fun with your loved ones and you can spend some quality time taking in the natural breeze and some tropical sun to get you in the holiday mood. The swimming pool is accompanied by some sun loungers, where you can relax after a refreshing dip and sip on some cocktails for a complete experience. An outdoor dining area is also provided to the guests to enjoy an exotic dining experience. The spacious and stylishly decorated living area includes the dining and kitchen area, for the convenience of the guests at Villa Basu. The living room is furnished with the utmost comfort of the guests in mind, with plush couches and armchairs. The room also has a flat-screen TV, where you can enjoy some films if you wish to relax indoors as the room is air-conditioned. It opens out to the swimming pool so you can even have some fresh and clean air in the room at all times. The dining and kitchen-area is fully-furnished with a dining table in the middle of the room which can seat all the guests comfortably. The fully-equipped modern kitchen is fitted with everything you could require, if you wish to cook for yourself and your loved ones. The staff at Villa Basu is friendly and provide regular house-keeping and other services to the guests for their ease and comforts. They will cater to all your needs without any hesitation and you can seek their assistance in case you need recommendations for where to go and what to visit on your trip in Phuket! 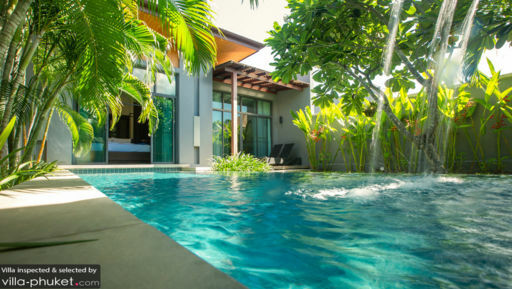 There is much to see around Phuket, and Villa Basu is located close to Nai harn beach and Rawai beach, both great spots for swimming and observing the sea from the sandy beaches. There are numerous restaurants around the villa offering you a lot to choose from including local and international cuisines!